One of the must haves in our opinion is a key override. Skip those that don’t have it. While some allow you to “jump start” the electronic lock with a 9v battery, it’s simpler to keep a spare key around than a battery. 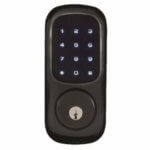 All of our recommendations are electronic locks with key override. Unfortunately, it seems most vendors are trending away from having a key override feature os they can save money. Other than this, it depends on your desires. See below for a list of additional features you want to take a look at. Simple, straight forward keyless access in a well built package from Schlage. The addition of bluetooth support in a still-affordable package from Yale. My favorite. This is the deadbolt on my home. Touchscreen, Z-wave alarm system support, and Alexa. No bluetooth. From Yale. Who Should Buy an Electronic Deadbolt? Families with children: One of more of my kids are always outside playing, running around or simply walking home from school. Having the electronic deadbolt with keyless entry means that whenever they get home, they will be able to get in without having to search for a key, and they will never be locked out due to a lost key. If one child heads outside, the electronic deadbolt can be set to automatically lock behind them so it continues to protect anyone still in the house. Relationships: We’ve all had relationships that have failed. Whether it’s the cleaning person, dog walker, or a significant other there are times when you want to make sure that someone that had access to the house, no longer has it. Rekeying your home locks does that but with keyless door locks it’s much easier. User codes (credentials) for electronic deadbolts can easily be given out and removed as desired so that those soured relationships no longer have access to your home. Renovation: Renovating the kitchen or another part of your home? You can issue temporary codes that can easily be removed after the renovation is completed. There are several optional features available on electronic deadbolts. Bluetooth (program from your phone, send temporary digital keys to someone), z-wave (allows you to integrate to an alarm system), and Alexa support. What about keypad deadbolts with Bluetooth? Electronic deadbolts with blue tooth allow you to program the lock via your smart phone. They must be near the lock to communicate via Bluetooth. 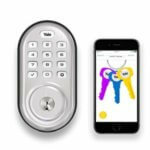 They enable your phone to act as the key to the lock so either by proximity or specific phone motion they will unlock the electronic deadbolt without having to manually enter a code or use a key. They also give you the ability to send, add, remove and send electronic keys for your deadbolt. Bluetooth deadbolts basically add ease-of-use lock features. This is very useful when you have a push button lock because they can be a bit difficult to program; some even require that they be taken apart to add and remove codes. We personally find the Bluetooth deadbolt features a little redundant on touch screen electronic deadbolts. Touchscreen deadbolts are very easily programmed. You can create a code or remove one very quickly. Though it is a bit easier change codes with a Bluetooth app, for touchscreen deadbolts the additional cost may not be justified. That’s why the keyless touchscreen deadbolt we recommend does not have this feature. You can always upgrade to the one with bluetooth if you want it, but we didn’t see the value added for the cost. If you are interested in a touchscreen that has blue tooth, you can find the Yale YRD426-ZW2-619 Z-Wave Plus Touchscreen Deadbolt Assure Lock with Bluetooth deadbolt on Amazon here. What does z-wave add to your electronic deadbolt? You can change/issue codes using an app from your smartphone from anywhere you have an internet connection. You can monitor the status of the keyless deadbolt from you phone and even lock and unlock your deadbot remotely. The status of the lock is monitored by your alarm system and may trigger your alarm when it detects forced entry. The can be set to alert you when a specific code is used on the lock. Say for example your child has arrived and entered the home. Schlage makes a very nice lock in this category but it requires external devices be added to use all the features and has a monthly enrollment fee of $9.99 at the time of this writing. What about other deadbolt features? Electronic deadbolts can come with a myriad of other miscellaneous features that may be useful for your particular lock application. Alexa and Google Home compatibility are few. To integrate with Alexa you will need some sort of a smart hub so that everything can be linked together. Smart Things is one such hub (check pricing on Amazon) as is Wink. The hubs allow you to control other various things int the home in addition to the locks such as lights and AC/Heat. A good investment if you’re looking for full home automation. To be honest, we haven’t seen those features put to use so we are not able to provide much detail on them. But if those lock features are needed and you have those systems, you may want to checkup on what they can do for you. The Schlage BE365 Series Electronic Deadbolts. This was one of the first code deadbolts to hit the market. All of the kinks have been worked out, and it is a tried a true quality deadbolt. We’ve installed over a 1,000 of the Schlage push button coded deadbolts, and I cannot recall every going back to fix one. Schlage has always produced quality products, and this deadbolt is no exception. If you don’t need all the bells and whistles but are looking for a quality product that will last and last, this is it. The Yale YRD416 Series Deadbolts. We love Yale products. They are affordable and high quality. This is one of the few non-touch-screen smart deadbolts you can buy that has support for bluetooth and issuing of electronic keys. It is sleek and comes in the most common finishes. The Yale YRD226 or YRD426 Deadbolts. These touch screen deadbolts are high end and durable. You can get a base version, with simple code access, or hegh-end versions that include bluetooth and/or z-wave and Alexa support (requires an additional hub shown here on Amazon). We’ve installed hundreds of the Yale Touchscreen deadbolts and have only had to replace one under manufactures warranty. Some versions of these do NOT have a key override. We recommend avoiding those and sticking to the one’s that do have key overrides. ← Need a Key Made? ACME Locksmith Makes Them All.